State lawmakers are beginning what may be a contentious 100th legislative session. 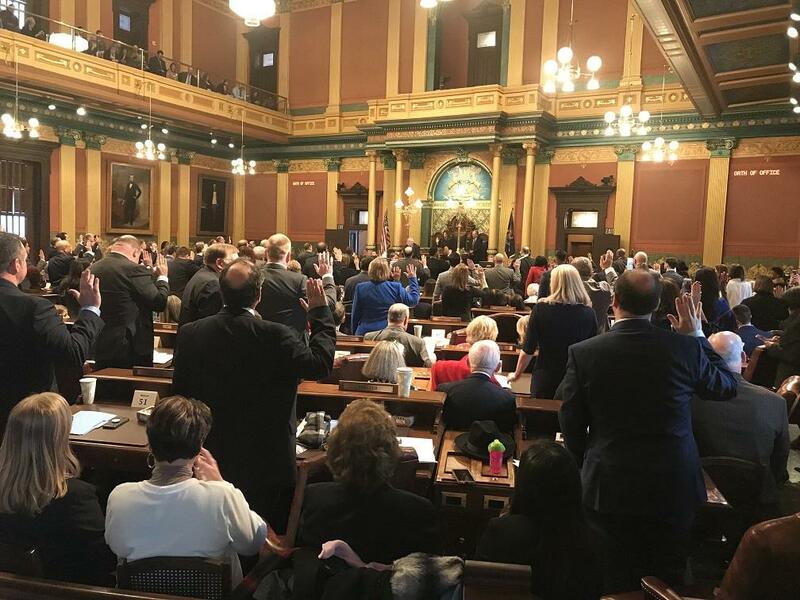 Michigan Supreme Court Chief Justice Stephen was busy Wednesday morning asking state senators, “Do you solemnly swear that you will support the Constitution of the United States....” as they were sworn into office. The lawmakers were all smiles at the ceremony-heavy opening day. But the next few years may be marked more by division than agreement. Democrat Gretchen Whitmer won the governor’s race in November’s election, ending eight years of Republican control of the state’s executive office. Democrats also took the Attorney General and Secretary of State’s office. But Republicans held onto slim majorities in the state House and Senate. Differing legislative priorities are expected to lead to clashes between the legislative and executive branches of state government for the next few years. Gov. Whitmer will formally lay out her agenda next month, and will deliver her first State of the State address on February 5. The Democrat's speech is scheduled for 7 p.m. during a joint session of the Republican-led Legislature at the Michigan Capitol building. Her office announced the time and date on Wednesday. The State of the State address is a chance for the new governor to unveil her policy agenda to lawmakers and a television audience.